In a December 18, 2012 legal filing, the Pennsylvania Department of Environmental Protection’s Environmental Hearing Board was asked to issue an Order of Supersedeas that would prevent the Tennessee Gas Pipeline Company from proceeding with mobilization and tree clearing, the first steps in construction of its proposed NorthEast Upgrade Project (TGP’s NEUP). 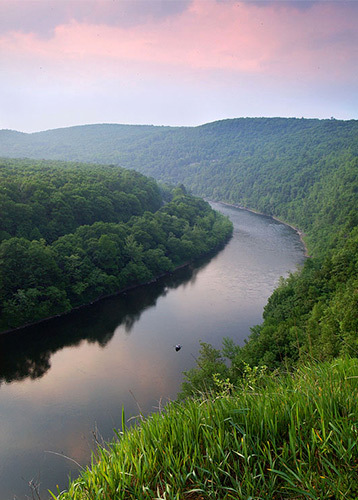 The Delaware Riverkeeper Network and Responsible Drilling Alliance filed the petition, essentially a request for a stay of construction activity, together with their notices of appeal of three DEP permits issued for the project, in order to allow the groups enough time to pursue their legal challenge while maintaining the status quo. The Petition for Supersedeas requests the EHB to supersede the Pennsylvania Department of Environmental Protection’s (DEP) decisions to approve an Erosion & Sedimentation Control General Permit and to approve Water Obstruction & Encroachment permits for Wayne and Pike Counties for the TGP NEUP project. The Petition, filed by attorneys on behalf of the Delaware Riverkeeper Network, the Responsible Drilling Alliance, and the Delaware Riverkeeper, Maya van Rossum, asserts that DEP’s decisions to approve TGP’s applications for these various permits violated the law in at least three ways. First, TGP has a record of recent and on-oing environmental violations on pipeline upgrade projects on the same pipeline that clearly shows TGP cannot be trusted to comply with environmental laws. Second, DEP approved the permits even though the permit applications failed to meet the substantive requirements of the regulations. Third, DEP issued the Erosion and Sediment Control permit despite unrebutted expert analysis from the Pike County Conservation District finding that TGP’s plans contained serious technical deficiencies. Tennessee Gas Pipeline Company’s Northeast Upgrade Project is an interstate transmission line upgrade project.. The NEUP is the final pipeline upgrade project in TGP’s multi-stage 300 Line upgrade project, although TGP has misrepresented that reality in order to avoid critical environmental regulation and oversight. Three of the loops that are part of this project are located within the Delaware River Basin (Loops 321, 323, and 325), which span Wayne and Pike counties in Pennsylvania, and Sussex county in New Jersey. The project includes pipeline drilling activities under the Delaware River, significant new grading and clearing of previously undisturbed forested land and steep slopes, 90 stream crossings, 136 wetland crossings, and 450 acres of land development within our watershed alone. Highpoint State Park and Delaware State Forest are among the public lands to be damaged by this project. Currently, the western leg of the 300 Line runs from compressor station 219 in Mercer County, Pennsylvania to compressor station 313 in Potter County and consists of a 24-inch-diameter pipeline with a completed 30-inch-diameter loop along its entire length. Within the last 24 months Tennessee has applied to FERC for approval of four projects that together will compose the Eastern Leg of the 300 Line, starting at compressor station 313 in Potter County, Pennsylvania and stretching east to a delivery point in Mahwah, New Jersey.